Speaking at a press conference yesterday, the Minister for Defence, Steven Smith, announced an independent review of the future use of naval base, Garden Island, for visiting cruise ships. Following the results of a NSW Government report highlighting the increase of cruise ships visiting Sydney, Dr Allan Hawke AC will be completing a review to assess the scope for a more flexible approach to utilising the area. Dr Hawke has recently completed a review of the future management and use of the Woomera Protected area. I spoke with a representative from Mr Smith’s office yesterday and they highlighted the importance that Garden Island be used first and foremost as a naval base. 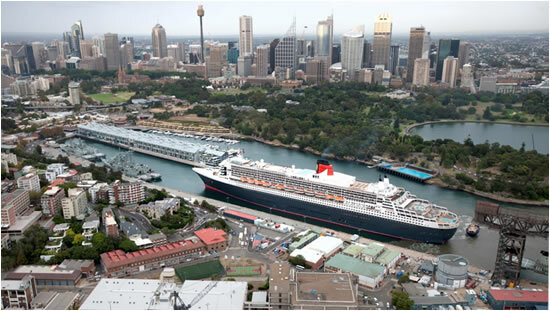 It is expected, however, that there will be room for added flexibility for cruise lines to be able to secure advanced berth bookings should the Overseas Passenger Terminal at Circular Quay (OPT) be unavailable. Carnival Australia CEO Anne Sherry welcomed Mr Smith’s announcement and Dr Hawke’s appointment. “Carnival Australia commends the Federal Government for taking steps to address the serious infrastructure constraints faced by the cruise industry in Sydney Harbour with the review ensuring shared use of naval facilities can be explored fully and in an open and transparent way,” Ms Sherry said. “Studies showing that by 2020 almost two-thirds of port calls to Sydney Harbour will be ships that have air draft restrictions and therefore cannot safely navigate under the Harbour Bridge,” Ms Sherry reported. It is expected that other cruise lines will follow suit in their support of the review with further details regarding the results released in the coming weeks. My thoughts on this review are simple…we need an alternative to OPT in Sydney. With more megaliners visiting and basing themselves in this city, the city needs to respond. Garden Island, whilst not as ideally located as OPT, is the perfect choice to utilise current infrastructure rather than spend money on a completely new terminal. The only issue is scheduling and whether or not the naval ship schedule corresponds with when the various cruise companies require space. What are your thoughts on the cruise terminal situation in Sydney? Where do you suggest the government look at positioning a terminal if the Garden Island option doesn’t work out?